He has published several books on Millenialism. The latest, Heaven on Earth: The Varieties of the Millennial Experience, will be published by Oxford University Press in December 2010. Landes is a strong supporter of the state of Israel, and a vigorous critic of what he considers anti-Israel propaganda in professedly objective news reports, and from supposedly impartial neutral bodies. In particular, he denounces the “mainstream” press for uncritically repeating stories from Palestinian sources about civilian casualties from Israeli actions, even when these stories may be exaggerated, distorted, or false. Though he has never denied that Palestinian civilians have been killed and injured in Israeli operations, he has cited evidence that these casualties have been overstated for propaganda purposes. He has coined the term “Pallywood” for the practice of filming staged funerals, casualties, and other evidence against Israel for the benefit of European and American news organizations. “The Second Draft” is exclusively devoted to anti-Israel propaganda in the news, with essays, articles, and archived video. Landes has been particularly concerned with the alleged shooting of Muhammad al-Durrah by Israeli troops, and the inflammatory reporting of the incident by French television. Landes has also helped establish Understanding the Goldstone report, a multi-authored Website devoted to exposing and refuting alleged inaccuracies in the Goldstone report on Israel’s operations in the Gaza Strip. 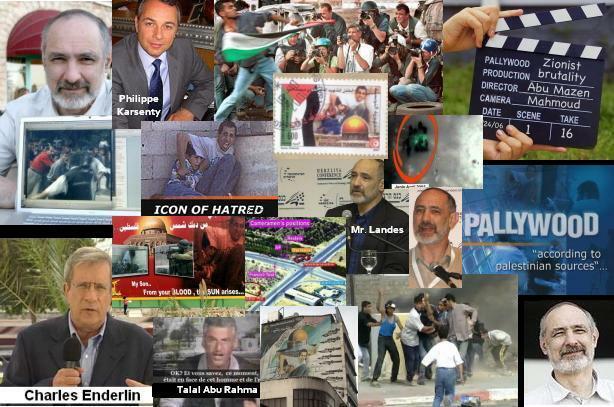 Professor Landes has produced some great documentaries on Pallywood and the Mohammad Al-Durah Affair. They can be downloaded at his site here. Why won’t the New York Times accept responsibility for repeatedly publishing a falsehood which caused many deaths? Have you read about exposure of the hoax in the Times or other mainline media (excepting the Wall Street Journal and New York Sun)? That the al-Dura lies incited murders of many innocent people is indisputable. The Jihadis who beheaded reporter Daniel Pearl inserted repeated footage of al-Dura in their gruesome video. Osama bin Laden cited al-Dura as a justification for his carnages in a post-9/11 recruitment video which showed the boy’s “death” 12 times. Streets and plazas–including the street on which Israel’s embassy in Cairo is located — were named after the boy. Sontag, a serial second-generation fictionalist, recently published a Sunday front-page article portraying returning U.S. combat personnel as deranged murderers; the Times’ Public Editor hastily acknowledged that her statistics were faulty. Nevertheless, the Times continued to publish opinion columns accepting the faked footage as truth, e.g., on August 21, 2005, the Times published a column by Palestinian publicist David Kuttab “Live from Gaza” referring to “an interview with the parents of Mohammad al-Dura, the boy who was photographed dying in his father’s arms.” The Times never published an opinion piece challenging the falsification. The Times was not alone in this saturnalia of bigoted journalistic incompetence. Time Magazine Europe honored al-Dura as “Newsmaker of 2000.” The editor of the Independent, concluding there was “no room for doubt,” excoriated the press for insufficient hostility to Israel. The London Telegraph agreed that al-Dura provided “provocation for revenge.” The London Review of Books published a Requiem for al-Dura, eulogizing him as “an infant Jesus.” National Public Radio ran puff interviews acclaiming the France 2 team as journalistic giants. The Palestinian cameraman who faked the footage says: “Journalism is my religion.” Journalism awards were showered on France 2. The Contemptible Afterlife of Media Falsehoods: Will Anyone Accept Responsibility? The afterlife of these falsehoods is even more contemptible than the initial reporting. Though the French Court decision was circulated by Reuters and the Associated Press (to which most newspapers subscribe) it was reported only in France and Israel. The New York Times has not published a word about the exposure so far as I ahve been able to find. We are only a website with some unusually revealing and important video footage we think many people need to see. Because those of us working on the opening dossier at this site are primarily American, French and Israeli Jews, that constitutes the initial core inspired to put up this website and to manage the material that comes in about Pallywood. thank you for your coverage of my work. just want to point out that the article in American Thinker on the NYT and al Durah is not my work. also, i think it’s pretty amazing that someone who tries to get at the truth is, almost by definition, a conservative (not really my ideological orientation). amazing, indeed! by the way, I got to meet and shake your hand a bunch of years ago at Binghamton University when you were debating Hitchens about radical Islam. Thanks for being so nice and friendly back then!